The Char de bataille was Col. Estienne’s concept. The French “father of tanks” wrote a memorandum (Mémoire sur les missions des chars blindés en campagne) in 1919, full of war experience, tactical reports and theoretical concepts of mechanized warfare, notably the proper use of different types in the offensive. 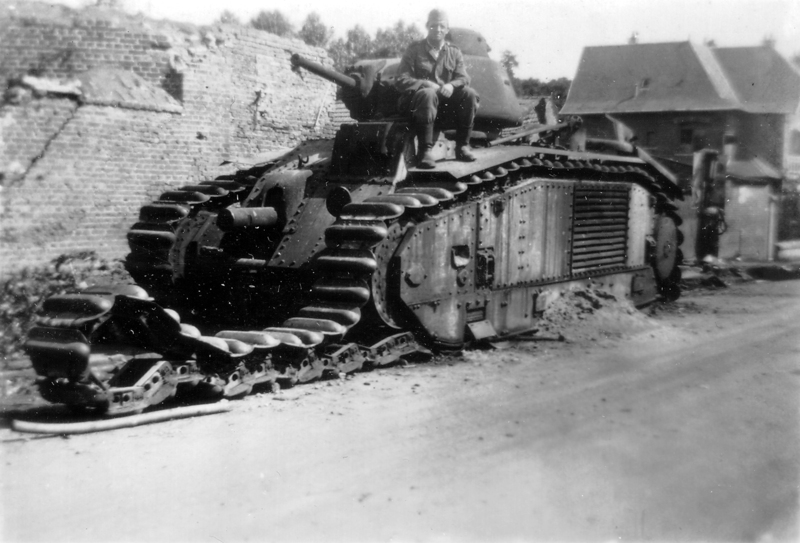 The “char de bataille” (“battle tank”) was a heavy tank, near to the “char de rupture” or “breakthrough tank”, but the former was more a dual-purpose (infantry support and antitank) machine than the “char de rupture”. The latter concept gave birth to huge the FMC F1, with the sole purpose of terminating fortifications. This duality was at the very core of the idea, shaping the many prototypes which followed in response. In 1921, the project was studied by a commission led by General Edmond Buat. First specification was for a low-cost self-propelled artillery, 25 mm (0.98 in) of armor and some machine-guns in turrets. Maximum metric weight was 30 tons. The project evolved and the machine-gun turret was equipped with an antitank 47 mm (1.85 in) gun. The main gun was a 75 mm (2.95 in) howitzer, in a low hull sponson. Industrial rivalry in the past had delayed several projects, including the FCM 2C, so Estienne was poised to create a formal agreement, submitted to the industrialists involved, free to share their plans, with the promise of no less 1000 orders. The Army was then to choose between the projects and various patents to compose their model, built by all. The four companies involved in the project were Renault and Schneider (SRA and SRB), FAMH (Saint Chamond) and FCM (Forges et Chantiers de la Méditerranée) with the FCM 21. The four projects, one for each company, were submitted to the commission on 13 May 1924 at Atelier de Rueil. The twenty kilometer test course proved too much for them, showing the haste of their conception. The commission, over the supervision of Estienne, choose the SRB as a base. The SRB (Schneider and Renault project) weighed 18.5 tons, was 6 meters long (19.7 ft), with modified FT tracks, an antitank 47 mm (1.85 in) gun, Renault six-cylinder 180 hp engine, with hydraulic Naëder transmission from the Chaize company combined with a Fieux clutch and Schneider gear box, a speed of 18.5 km/h (11.5 mph) and a 370 l fuel tank giving a 370 km (230 mi) autonomy. This prototype then received many modifications, including the 75 mm (2.95 in) howitzer, new Holt-type tracks, the FAMH suspension, track tension wheel and a small gangway to access to the engine, with 40 mm (1.57 in) armor. The design process of this modified SRB led to the 1926 “tracteur 30”. The plans were made by Schneider’s chief engineer, revised by the STCC (Section Technique des Chars de Combat). 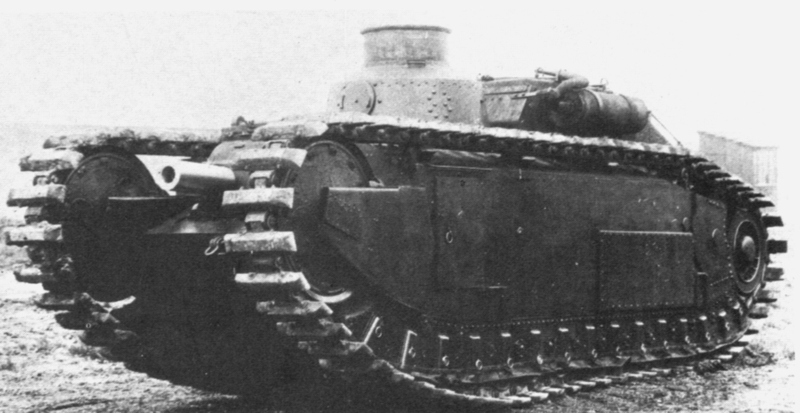 A mockup was built by Renault and three prototypes were to be built by the companies involved, with some modifications by the new 1926 “direction de l’infanterie”, changing it to a primary infantry support tank. Modifications of the design included no AT weapon, lower speed, 22 tons max and radio for coordination. The three prototypes of the “B” serie (n°101, 102 and 103) were ready by 1929-30. They differed by their engine, clutch, transmission and served both for technological and tactical experiments, at the champ de Châlons, forming the “Détachement d’Experimentation” unit in 1931. They were extensively used in maneuvers until 1934, each time with some modifications by the Atelier de Reuil near Paris, to meet new requirements and army specifications. In the end, the B1 received its final turret, with the low velocity 47 mm (1.85 in), and coaxial Reibel machine-gun. Like the 1924 prototypes, it had a very large track, inspired by earlier famous British models. Armor also protected the suspension and the hull was riveted. The Renault inline 6 cylinder 16.5 litre petrol engine was chosen, which provided 9.7 bhp/ton, the power was transmitted by a double differential steering system, 5 forward, 1 reverse gear. The suspension was in the form of bogies with a mixture of vertical coil and leaf springs. 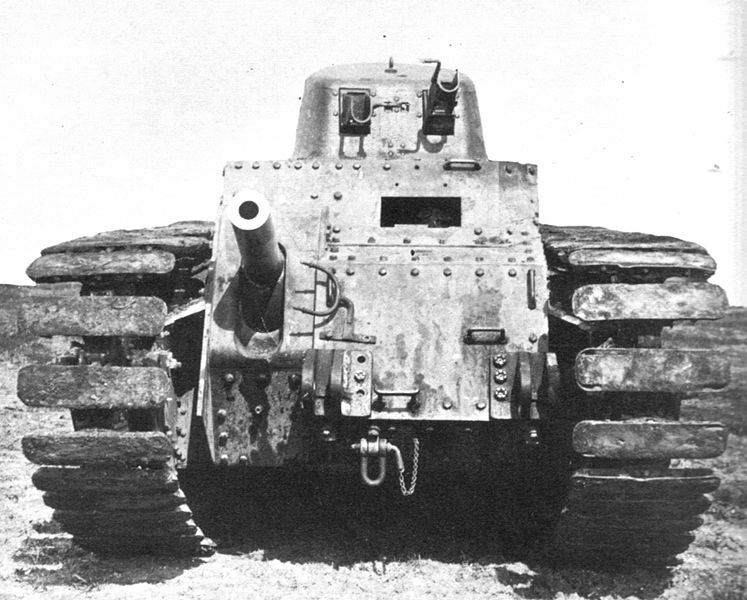 Both early and final turret designs (APX1) were one-man only. Production started in 1935, with Renault building 182 Chars B, AMX -a Schneider subsidiary- 47, FCM 72 and FAMH 70. At 1.5 million francs apiece, it was by far the costliest tank ever built en masse. Consequently, the original order of 1000 was reduced to 400. This further increased the tension between the two doctrinal schools which had influence then, one professing the use of a few, heavily armored battle tanks, while the other advocated the use of swarms of light tanks. 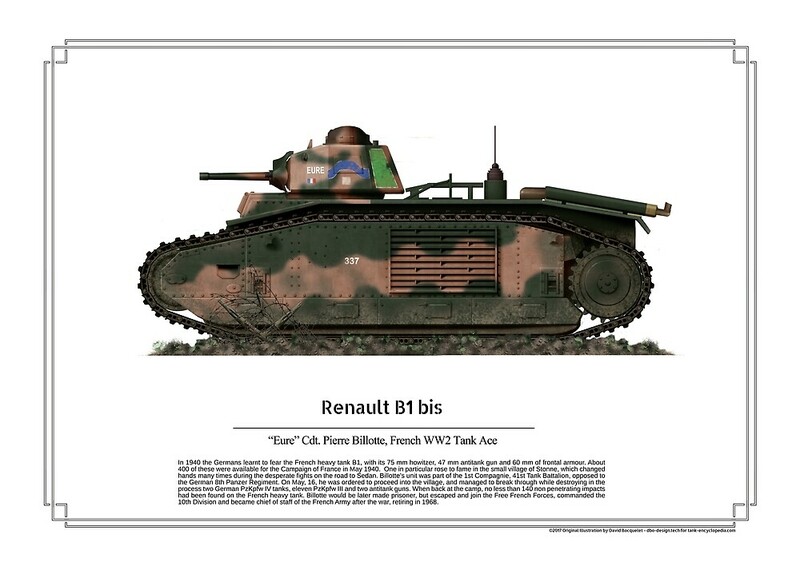 Almost ten light Renault tanks could be built for the price of a single B1. Despite all problems, monthly production reached 41 by May 1940, and when it ceased in June, 25, 369 has left the factory floor. 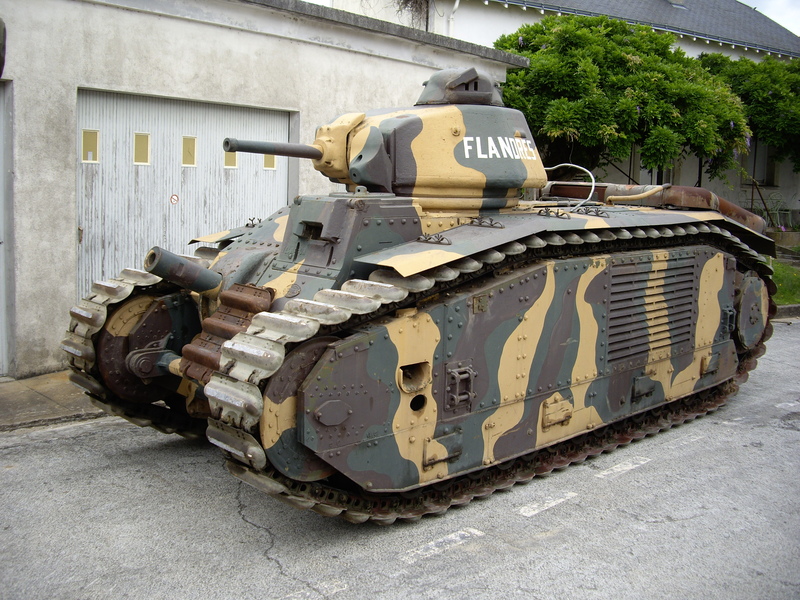 As the few, even more expensive and now largely obsolete FCM 2C was kept out of real operations, the B1 became the main French “char de rupture”, a specialized breakthrough tank in specialized units. Operational capabilities were limited by their high consumption, which in turn limited their range and condemned them to be used in strategic reserves. In fact they formed the “Divisions Cuirassées de Réserve” (DCR) with limited strategic flexibility, intended for the second phase of the assault. The B1 had some shortcomings which had to be dealt with. An obvious lack of antitank firepower, with its low velocity L27/6 SA34 47 mm (1.85 in), which was only given APHE rounds (high explosive), capable of defeating 25 mm (0.98 in) of armor. The 75 mm (2.95 in) SA35 ABS L17.1 howitzer could fire HE and APHE rounds, only suitable against fortifications, with a poor traverse of only one degree. The aiming was given to the driver’s abilities with the Naëder hydraulic precision transmission. It was served by the radioman and the commander, who was also given the task of aiming and firing the turret 47 mm (1.85 in) gun. Communication was assumed by an ER53 radio telegraphy set, which worked with Morse code only. There was a small corridor, right on the rear, giving access to the ammunition reserve, next to the engine. The main access door was on the right side. The suspension system was rather complicated, made of three main bogies, sprung by vertical coil springs, each supporting two others, with a pair of road wheels. Production of the B1 was very slow. Only 34 machines were delivered until July 1937. By then, there was serious consideration given to an upgrade, which led to the B1 bis. The B1 bis was a modernization of the type, with an emphasis on anti-tank capability and protection. The armor was uprated to 60 mm (2.36 in), and a new APX4 turret with a longer barrel (L/32) SA 35 47 mm (1.85 in) gun was mounted. To cope with the added weight (now 31 tons), a new engine was fitted, a V12 Renault capable of 307 bhp (229 kW). 35 of the first series were retrofitted with the new engine. Autonomy was limited to only 180 km (110 mi). There had been some attempts of towing an extra 800 l fuel tank, but it never realized. At cruise speed, reserves were exhausted in just 6 hours. A larger left air intake was fitted. Ammunition storage was improved between the beginning and the end of the production, from 62 to 72 47 mm (1.85 in) rounds, but still, no AP shells. Production started in April 1937 and stopped in June 1940. By then, 377 had been delivered out of an order of 1144, but only 129 were ready in September 1939. In exercises, the complex and advanced hydrostatic steering Naëder system proved difficult to use and costly, betrayed by other technical elements like a porous bronze housing and feeble seals causing significant losses of castor oil. The TSF was not practical, as the tanks needed to be at rest to communicate. No tactical coordination was possible on the move. The costly turret was slower to produce than the hulls and three B1 bis were ultimately put in service without turret, as gun carriages. The B1 ter was a late attempt to radically improve the design. The main features were new 75 mm (2.95 in) armor welded with slopes to the hull, a new 350 bhp engine to deal with this added weight (36.6 tons) and some simplification in the design for mass-production in 1940, like the omittance of the Naëder transmission. Rearranged interior allowed a fifth crew member to be carried, as a mechanic. The main howitzer received better traverse, 5 degrees higher. Only two prototypes were ready by June 1940. Production never started. The B1 had some additional flaws as well, which never helped its performances. High consumption issue, which was aggravated by any aiming of the main howitzer, was never solved. The absence of an efficient compass orientation and no internal communication system were also resented in operations. The one-man APX-1 turret was also cramped, ergonomics were poor, and the feebly armored cupola had inadequate means of vision. Plus, the barrel pointing device was quickly deregulated. Many other issues were never solved because of the delays. The most serious was of course disastrous tactical management. B1s were “wasted” at individual defensive spots, many were simply outmaneuvered. But despite all this, the B1s were still, tank to tank, formidable machines, which proved very effective in single actions. Despite its obsolete features, low autonomy and speed, the B1 was hard to stop. Its most formidable assets were its huge armor and good firepower, then unmatched in the west. The 60 mm (2.36 in) frontal armor was sloped, which mean it was near 80 mm (3.15 in) effectively. There were no real weak spots, and this invulnerability helped the B1 to close on targets, then destroy them with the turret 47 mm (1.85 in) or the brute force of the howitzer HE shells. For this reasons, the B1 was the Wehrmacht’s most feared enemy tank, a mechanized nightmare which caused heavy casualties by itself during the few fights in which it was engaged. The Germans never experienced such losses in tank to tank combat until the fall of 1941, when encountering the Soviet KV-1 and T-34. The Panzer I and II were absolutely harmless to the B1, and the Panzer III, with its thin armor and 37 mm (1.46 in) gun, presented no serious threat to the French heavy tank. As for the Panzer IV, it had only 20 mm (0.79 in) protection (Ausf. A). It’s standard gun was the low velocity, short barrel 75 mm (2.95 in) KwK 37, which was only effective at short range. For this reasons, the Panzer IV barely presented a real threat except in close, real time coordination with other vehicles. The same could be said about most German antitank guns of the time. The famous standard-issue “door-knocker” Pak 37 and even the Pak 40 were harmless. Contrary to common opinion of the time, the large ventilation exhaust panel was indirectly 55 mm (2.17 in) strong and never presented a weak point. When the war broke out in September 1939, there were perhaps 180 operational B1 and B1 bis in all. They were used for the Sarre offensive, a short-lived burst without serious opposition, with a massive force of 41 divisions and 2400 tanks. The aim was to distract and divert German forces from Poland, France’s ally. After slowly penetrating 8 km (5 mi) into enemy territory, the entire force withdrew by order of general Gamelin into the security of the Maginot line. Several officers, including Henri Giraud and Charles de Gaulle, wildly protested. In effect, the Germans would have been in great danger and the Rhine was in reach. But Gamelin then was so confident about the famous fortified line, that he saw any large-scale offensive to be a useless waste of material and men. During the “Phoney War”, all B1s were gathered in massive infantry support divisions, the “division cuirassés de réserve” or DCR, which were tactically committed in the second phase of any assault, the first being led by cavalry tanks like the SOMUA S35. No tanks were sent in Norway, but the real deal began in May 1940. Three DCR, comprising 69 tanks each, were mobilized. Part of the 37th Bataillon de Chars de Combat, which comprised only B1s, were all rearmed with long-barrel SA 35 guns in May 1940 (turret designation APX1A). After the German invasion began, four new DCR of 52 B1s were constituted, as well as five Compagnie Autonome de Chars (autonomous tanks companies), with 56 B1s in all, plus 34 more in the 28 BCC (Bataillon de chars de combat). All B1s were re-equipped with phonic versions of the ER53 radios, and command tanks received ER55 long-range radios. B1 tanks were used (and lost) during the first phase of the operations, especially the first week. Most counter-offensives against Guderian’s “run to the sea” counted at least several B1s. Without air support, these moves were doomed to fail against the quick and lethal Stuka attacks. Bad tactics of course brought these precious tanks to inept, hasty defensive “plugs” in the defensive lines, most of the time, ending in pure waste. 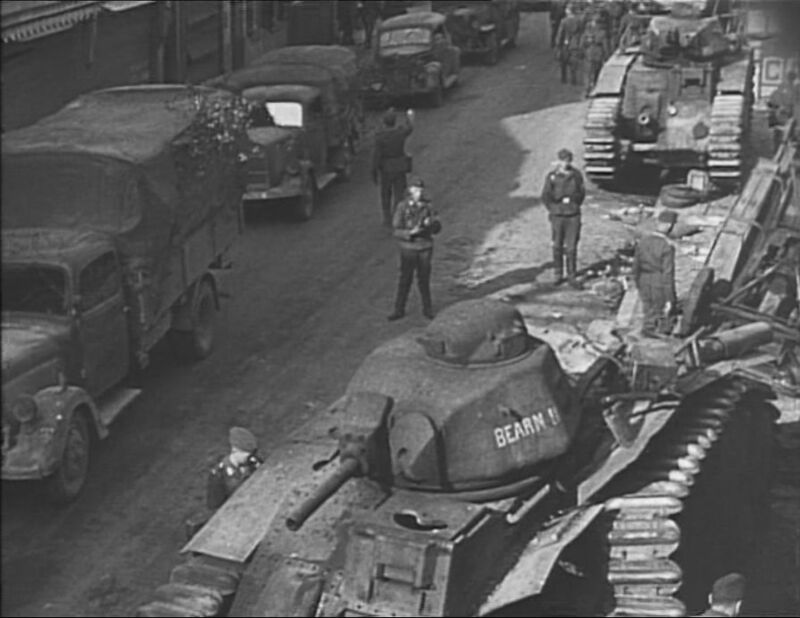 In some case, the B1’s extraordinary sturdiness allowed some success, notably the counter-attacks at Laon and Moncornet led by col. De Gaulle, and stiff resistance like at Hannut and particularly Stonne. During these events, some individual B1s blocked the German advance by themselves, inflicting horrendous casualties. In a particular case, a single B1, Eure, commanded by Captain Pierre Billotte, attacked frontally and single-handedly destroyed thirteen Panzer IIIs and IVs, and then withdrew, while being hit 140 times. During two days, B1 tanks from the 3rd Division Cuirassée de Réserve literally ruled the battlefield at Stonne, destruction coming only due to German overwhelming attacks against single tanks and excellent communication, air strikes and indirect fire (by German howitzers). Some B1s also broke down or ran out of ammunition and petrol. 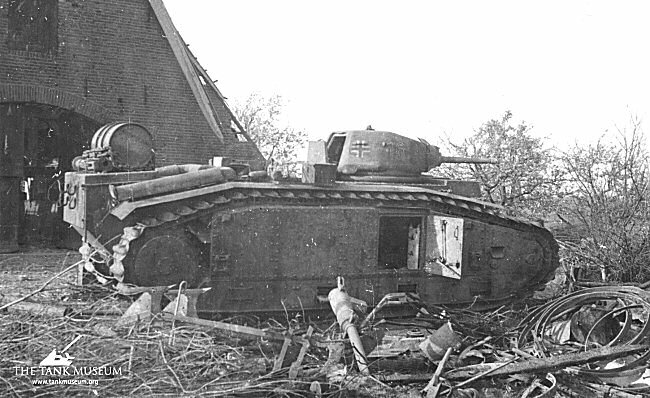 The last surviving B1s were mixed with other tanks in support of the so-called “hedgehogs”, which fell one after the other in June 1940. By the 26th of June, the campaign was over. On the 16th May 1940, A Char Bi bis No. 337 called Eure, became famous. It was part of the 41e BCC 2e Compagnie. It held off a column of the invading German 10th Panzer Division: fighting against 14 Panzer IV and Panzer III tanks. It withdrew with around 140 hits on its armour. It was finally scuttled by its crew on 13th June 1940 in Possesse. Char B1 model 1937 “Poitou”, 5th DCR, 3rd Army, Sarre offensive, September 1939. Many B1s were named after French régions, counties, French colonial territories and personalities. 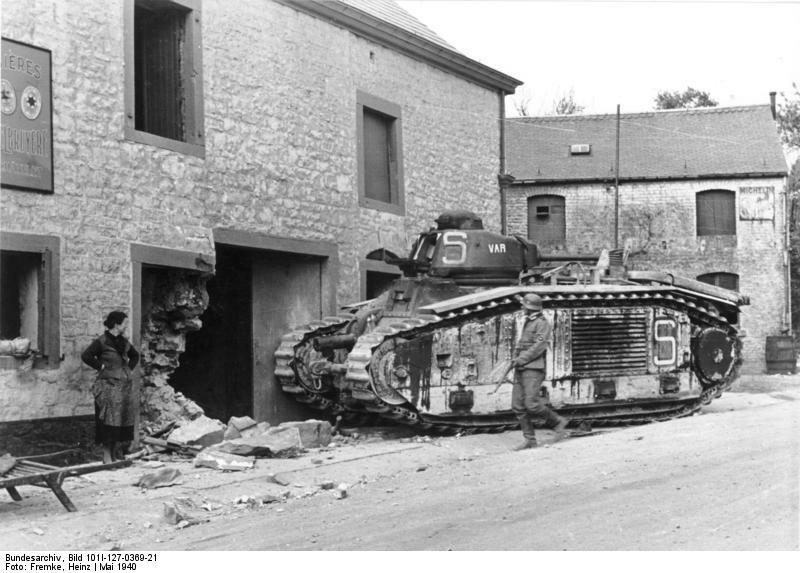 The Sarre offensive was launched with 41 divisions and 2400 tanks. This short-lived offensive drove 8 km (5 mi) into German territory, after which it was abandoned for political reasons. What followed was the infamous “Phoney War”. 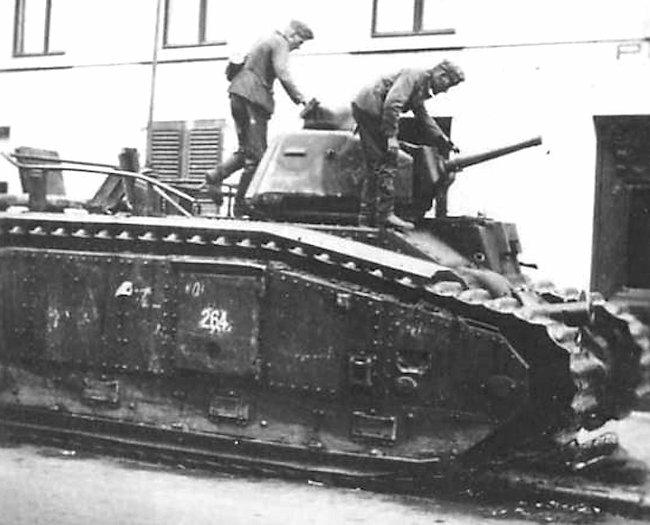 Char B1, 1940 model, retrofitted with the long barrel, high velocity SA35 turret gun. This significantly improved its antitank capabilities, despite the lack of armor-piercing shells. However, APHE shells from the howitzer proved very effective at short range. 4th DCR “division cuirassée”, Battle of Moncornet, 17 May 1940. B1 bis number 257 “Bourrasque”, 2nd Section, 1st Company, 15th Combat Tank Battalion, 2nd Armored Division, May 1940 . Tank number 481 “Vercingetorix”, 3rd Company, 46th Combat Tank Battalion, 4th Armored Division, France, May 1940. Char B1 bis number 467 “Nivernais II”, 2nd Section, 3rd Company, 37th Combat Tank Battalion, 1st Armored Division, June 1940. B1 bis number 205 “Indochine”, 3rd Section, 3rd Company, 15th Combat Tank Battalion, 2nd Armored Division, June 1940. Tank number 337 “Eure”, put in service within the 41st BCC, second company at Gien, 8 December 1939, then 1st company, 10 May 1940. This is the most famous French tank, making capt. 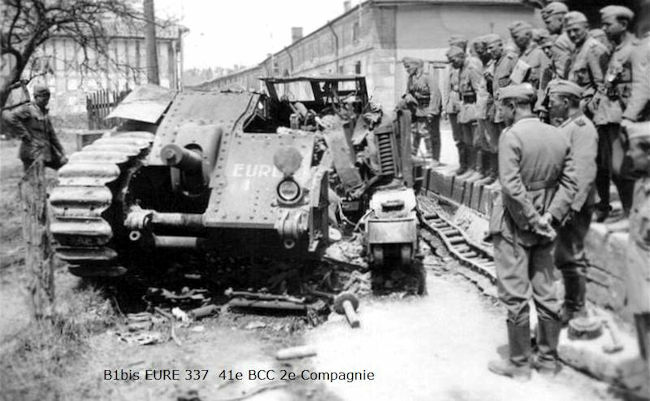 Billote the first (and only) French tank ace of the war, after a frontal attack on a column belonging to the 8th Panzerdivision in the town of Stonne, destroying 11 Panzer IIIs, 2 Panzer IVs and 2 Pak 37 antitank guns, while retiring safely out of the town. 140 non-penetrating hits were found. A major improvements over the previous models, the B1 ter was studied in 1937 to cope with previous limitations, including a 75 mm (2.95 in) gun with a longer barrel, sloped armor, full protection of the upper tracks (total weight 36.6 tons). According to some sources, two to five were built, but there is no evidence that they were ever put in service. The last preseries prototype was ready by early 1940, but production was cancelled for less expensive and simpler models. 105 mm (4.13 in) leFH 18/3 auf Gw B-1/B-2 740(f). 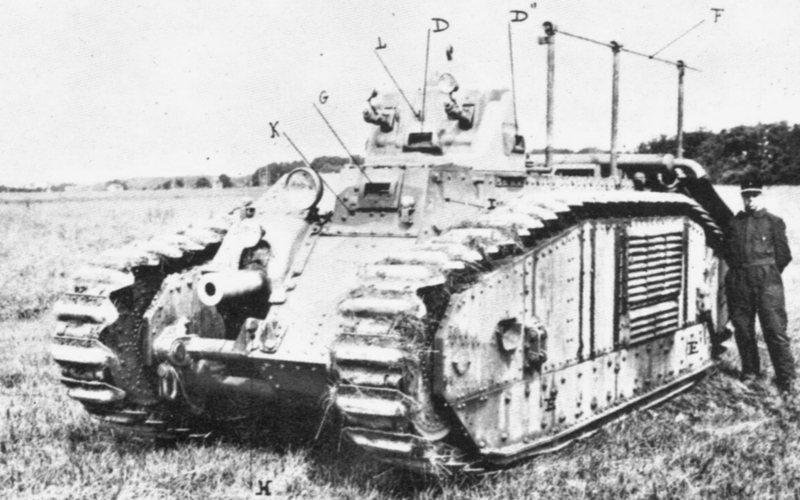 Thirteen were converted using standard B1 bis tanks. Fought on the Eastern Front, Operation Barbarossa. Fate unknown. Flammwagen auf Panzerkampfwagen B-2 (f), one of the sixty captured units converted as flame-thrower tanks. In this configuration, the 75 mm (2.95 in) howitzer was replaced by a flamethrower. Most served on the Eastern Front, in assault units. Their sturdiness was well suited against fortified positions with antitank defenses. 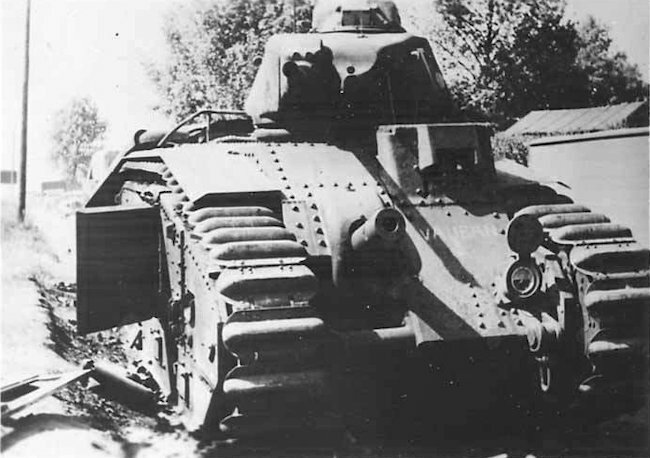 Char B1 bis number 505, one of the three turretless vehicles delivered in May 1940, equipped with an additional gasoline tank. Captured Char B1 bis FFI (Forces Françaises de l’Intérieur), battle of Paris, August 1944. The B1 bis “Flandres” (“Flanders”), one of the few salvaged in the world and the only one in running condition. It belongs to the “Association pour la Sauvegarde du Patrimoine Historique et Militaire”, at Fort de Seclin near Strasbourg, France, awaiting restoration, along with two other wrecks. One captured at Guernsey (under Wehrmacht colors) is now part of the Bovington Museum collection, repainted in French colors. Three are homed at the Saumur museum, “Flandres”, “Rhône” (static) and a mine storage hull. One is now part of a memorial at Stonne. 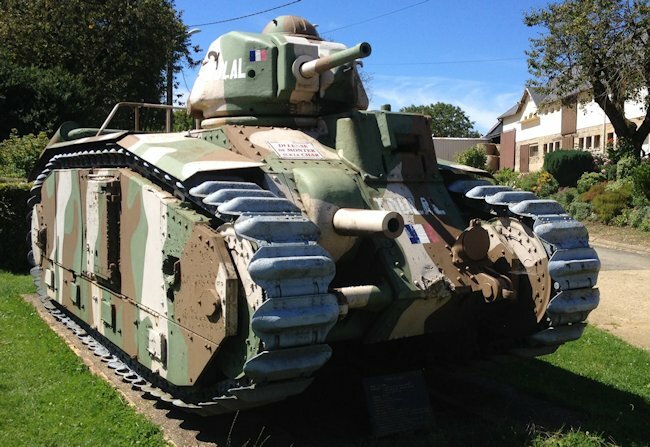 Two are on display at Mourmelon-le-Grand (home of the 501st-503rd Tank Regiments). 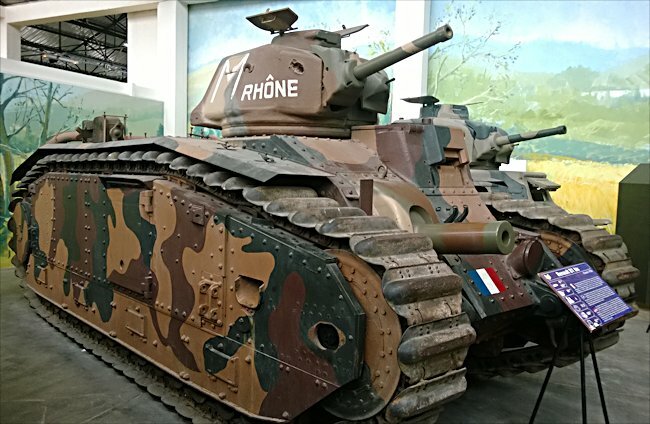 This Char B1 bis Tank can be found at the French Tank Museum in Saumur, France. The Germans captured hundreds of tanks, including no less than 161 B1 bis tanks, later pressed into service as Panzerkampfwagen B-2 740(f). Sixty were converted into flamethrower versions (Flammwagen auf Panzerkampfwagen B-2 (f)), and sixteen to carry the 105 mm (4.13 in) howitzer. A single unit was equipped only with B1s, the Panzer-Abteilung 213, stationed in the British Channel Islands. 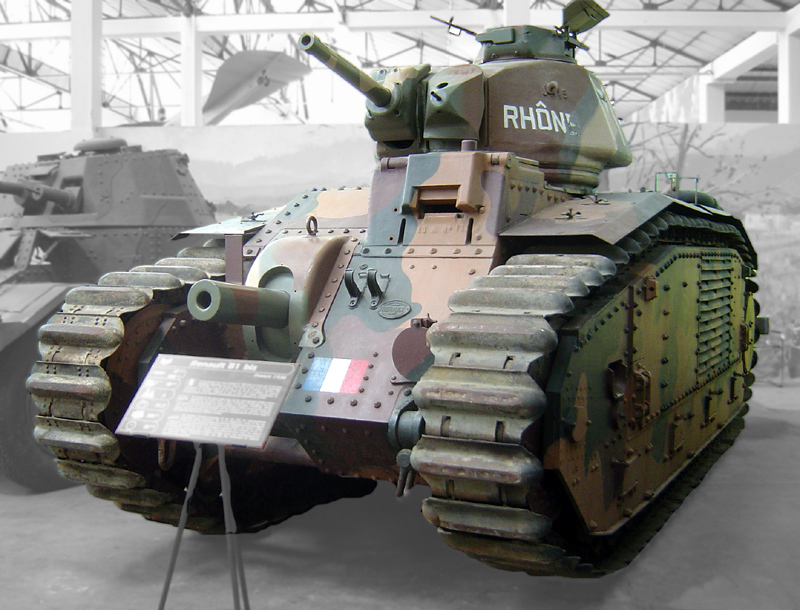 One of these ended at the Bovington museum, repainted in French colors. 17 units in all received modified B1s, as they saw service in the Balkans (March-April 1941) and the Eastern Front, where their armor and armament proved well-adapted against Russian heavy tanks. By 1944, they were all gone. Those stationed in France took part in the defense of Normandy, and others were stationed in support of the German units defending Paris. In August 1944 some were captured by insurgents and used for punctual actions by local FFI units. In 1945, German pockets of resistance in France, especially those on the western coast, were left to the FFI and the regular French 1st army. Edmond Voillaume’s 2nd Company was equipped with 19 B1s, which decisively took part in the reduction of the Royan pocket, and La Rochelle. B1s were also part of the 13th Dragoon Regiment, which took part in operations in Alsace and Southern Germany. They were stationed after V-day in the French occupied zone, until the unit was disbanded in 1946. Nice text and excellent illustrations. I would only suggest, if possible, the armor thickness and angles of the tanks. Whats the difference between the Char B1 and the Char B2? There was a German designation Panzerkampfwagen B2 740(f) but no French B2 designation ever. Not so. There were specs and in some cases drawings for a Char B2, B3 and BB. I am still researching this. I believe it’s the B1 1940 model. 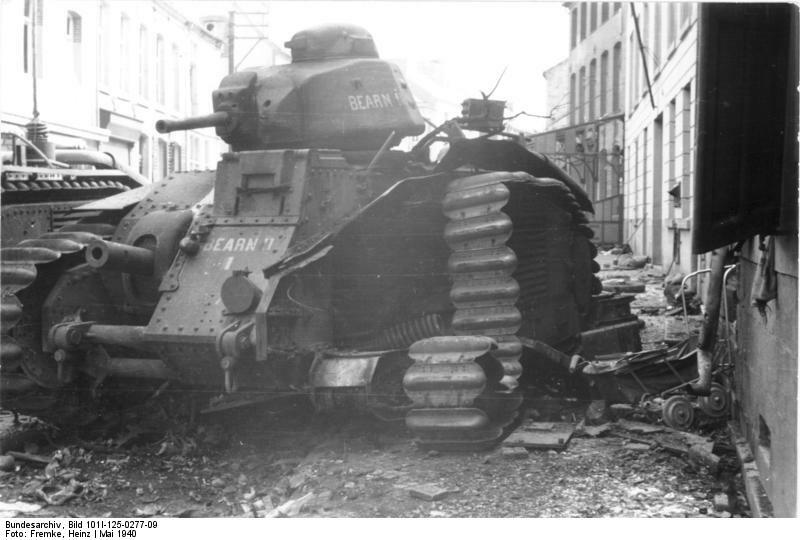 Were the Char B1s only used in combat during the Saar offensive? All action reports seem to involve B1 bis tanks.